A new school year is full of excitement and opportunities for children. New activities and new friendships are forged while a whole new learning adventure begins. Along with the excitement and novelty of a new school year, children with smart phones, tablets and classroom computers can be exposed to threats from online predators and bullies as they are also being exposed to a wide world of information and learning. Thankfully, there are several precautions a parent can take at the start of a school year to keep children safe while allowing them the freedom to enjoy technology. Taking a few back to school tech safety precautions is every bit as important as buying school supplies and new clothes, meeting teachers and doing all the necessary things to prepare a child for the new school year. Monitor your children’s online and social media behavior. According to an article at Education World, you can do this in a number of ways: by talking to your children, monitoring their apps and by setting up internet usage rules. You can also install the MamaBear Family Safety App on your child’s Apple or Android device to monitor your children’s behavior on Facebook and Instagram, including when they make new friends and are tagged in posts, photos or at locations. Be aware when inappropriate language or indication of bullying is posted to their profile with restricted word alerts. Also, teach your child that if you wouldn’t say something in person, you shouldn’t say it on social. Set up parental restrictions on their mobile devices. iPhones have a great parental restriction settings to monitor age appropriate content, music, apps and gives parents the opportunity to restrict in-app purchasing, adding apps or deleting apps. On iPhones go to settings/general/restrictions to set them up. On Android devices, a recent update to the operating system allows for some device restrictions for parents. Right now Android 4.3/Jelly Bean is available on Nexus devices but manufactures of other device types are anticipating a roll-out of the new operating system. Until then check Google Play for other apps that help with device restrictions. Control internet use at home. Place your children’s computer in a public area so they can’t isolate themselves when online. Limit the amount of time to use the Internet, or simply disable WiFi at certain times of the day to restrict his/her internet access. Set rules for mobile devices too. For instance, charge phones overnight in a common area, not in their bedrooms at night. Check up on their browser history on their phones for use of unacceptable content. Be aware of your child’s computer use at school. Ask questions about what their computer use is in the classroom. Create an open dialog that holds your child – and his/her teachers – accountable. Also, know your child’s school’s internet policy. Be aware of how your school district handles internet safety by visiting the school’s website and/or talking to school faculty and administration. If you have concerns about the policy, consider working to improve the Internet safety standards of the school district. Pay attention to warning signs. Be aware of whether your child is spending an increased amount of time online or on their phones, is isolating themselves, appears withdrawn or is exhibiting troubled behavior. These could be signs that your child’s safety is threatened. Awareness is one of the best ways to keep your children safe with their mobile devices. 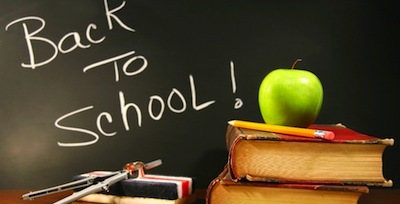 Going back to school is one of the most exciting times of the year for parents and their children. Keep that time fun and special by following these back to school internet safety tips, protecting your child so that she can safely embark on the adventure of a new academic year. The MamaBear app helps parents around the world to worry less about their children. Download the app today for iPhone devices here and Android devices here.